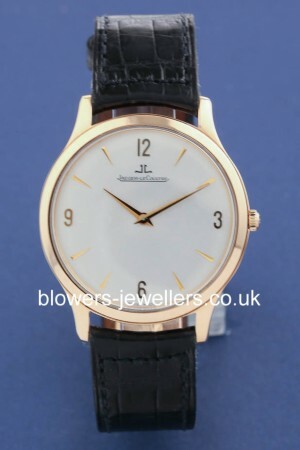 18ct pink gold Jaeger-LeCoultre Ultra Thin 145.2.79. Polished pink gold. Case diameter 34mm. Hand wound mechanical movement. Silver dial with applied Arabic and index hour markers. Black croc strap with 18ct pink gold folding clasp. Back secured with four visible screws and case back engraved with Master control 1000 hours tested. Box and papers dated December 2002. Our reference number S20411. SKU: 3015253. Categories: Jaeger LeCoultre, Master.